Ships tomorrow if you order in the next 21 hours 23 minutes. Auto Ship & Earn + 258 Points What's this? If you struggle with your blood sugar, the path to good health can seem daunting. Where do you start? 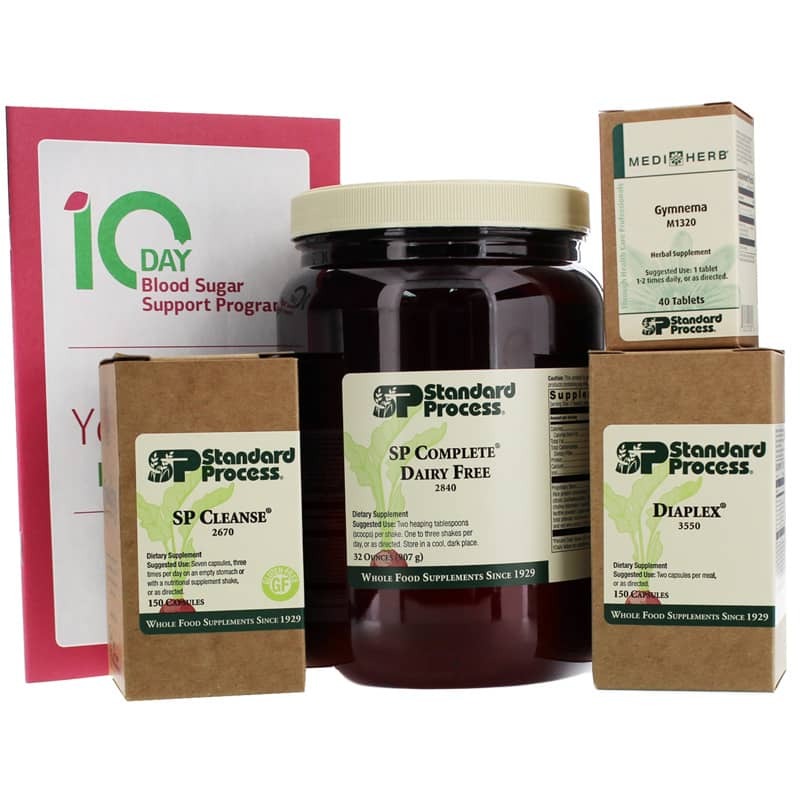 Take the guesswork out of your blood sugar health routine with the 10-Day Blood Sugar Support Kit from Standard Process. With four supplements and a patient program guide, this specially formulated kit is the perfect way to get started on a blood-sugar support routine. Healthy blood sugar metabolism is essential for normal energy levels, quality sleep, a balanced mood and a healthy appetite. The 10-Day Blood Sugar Support Kit includes SP Complete, SP Cleanse, Diaplex, Gymnema and a program guide. This whole-food, nutritional powder provides a convenient way to get a good nutritional base. It contains protein and amino acids from nondenatured whey protein, as well as antioxidants grains and vegetables. With 20 unique, whole-food and botanical ingredients, SP Cleanse supports the body's normal toxin-removal process. It supports normal kidney, liver and gallbladder function as well as digestive function. Diaplex helps the body to properly handle sugar to help maintain blood sugar levels already within normal range. With chromium and a proprietary support blend, it supports normal organ function and carbohydrate metabolism. Featuring a complex mixture of saponins (gymnemic acids) and other compounds, Gymnema is designed to help maintain healthy blood sugar and cholesterol levels already within a normal range. And with a program guide, you'll never feel lost or on your own in your wellness journey. With tips for success, a supplement schedule, food advice and a daily journal, the guide is there to keep you on track. Start your journey toward optimal health. Order the 10-Day Blood Sugar Support Kit today. ---Rice protein concentrate, flax meal powder, calcium citrate, magnesium citrate, buckwheat (leaf), Brussels sprouts (whole plant), kale (whole plant), choline bitartrate, inositol, alfalfa (whole plant) juice powder, sunflower lecithin powder, grape (seed) extract (includes Masquelier's OPC-85; 98% total phenolic compounds; 65% proanthocyanidins), carrot (root) powder, and red wine extract (70% total phenols). ---Betaine hydrochloride, bovine pancreas PMG extract, alfalfa (whole plant), calcium lactate, dried buckwheat (leaf) juice, buckwheat (seed), dried pea (vine) juice, oat flour, pancreatin (3x), bovine pancreas Cytosol extract, magnesium citrate, bovine liver, bovine spleen Cytosol extract, ammonium chloride, carrot (root), sweet potato, dried beet (leaf) juice, beet (root), defatted wheat germ, soy protein, potassium bicarbonate, pepsin (1:10,000), bovine pituitary PMG extract, bovine prostate, bovine kidney, enzymatically processed Tillandsia usneoides and beet (root), inositol, bovine orchic extract, L-cysteine hydrochloride, bovine adrenal Cytosol extract, bovine liver fat extract, vitamin E (sunflower), and flaxseed oil extract. Other Ingredients: Gelatin, chromium yeast, calcium stearate, stearic acid (vegetable source), water, starch, sucrose (beets), arabic gum, vitamin A palmitate, lactose (milk), niacinamide, ascorbic acid, pyridoxine hydrochloride, and prolamine iodine (zein). Women who are pregnant, may become pregnant, or are lactating should limit their intake of vitamin A (retinol) and use vitamin A products only as directed by a qualified healthcare professional. Consumption of large amounts of vitamin A (retinol) has been linked to serious health problems. If you are pregnant, nursing, taking medications or have a medical condition, please consult your healthcare practitioner before taking any dietary supplement. Keep out of the reach of children. Other Ingredients: Cellulose, calcium acid phosphate, sodium starch glycollate, hypromellose, magnesium stearate and silica. Other Ingredients: Cellulose, water, and calcium stearate. Not to be used during pregnancy and lactation unless otherwise directed by a qualified healthcare professional. Not for long-term use except under the direction of a qualified healthcare professional. If you are taking any prescription drugs, consult with your healthcare professional prior to use. Accidental overdose of iron-containing products is a leading cause of fatal poisoning in children under 6. Keep this product out of reach of children. In case of accidental overdose, call a doctor or poison control center immediately.